"Thank me no thankings, nor proud me no prouds." "Diamond me no diamonds! ...Prize me no prizes." Isabel, Sucia, Ola, then me, Americo—Americo because I was born here—then the twins. Not that the folks didn’t know that where they came from was also America, like on maps, all the way up and down, it’s America. But here, on the mainland, how it must have been for them the first years was: Finally, America! And finally a boy. I really don’t go for photographs, not too much, but that one looks good on the dash. You like this Batmobile? As the guy on the lot told me, “This vehicle, it belonged to a minister upstate, all it needs is that one bit of work you can see.” I was about to tell him that I’d never been upstate, and to keep his black car. But then it felt good to sit in—so you like it? Excuse the forest-green fender which I picked up out by Shea. I’ve got a spray can to paint it. Anyway, you can see that that’s an old picture—the photographer who came around lined us up according to height, or age, I forget which, but at the time it was the same. So Isabel, she went all the way through high school and was going to go up to City College that fall, but then she took her first trip down to the island that summer and phones from there to say she wants to get married. So Ma-mi went down and watched her get married. And the next year, pictures of her baby started to come up, and since Sucia was always as one with big sister, as was Ola with Sucia, within a few years they were also down there and married, and with the little ones. Then Ma-mi and the twins went ahead, down there to live, while Pa-pi sold the store. When he left, I traded our big upstairs apartment for the basement one—it’s not so bad. It’s below ground in the front but opens in the back to a bit of a yard. For the summer I rigged up a shower out there. I really only started reading books after the folks left. Right away I thought maybe I should have a system for it, so I go alphabetically by author, one book by one author. The first time around I was reading the books everyone knows, so when I was in the A’s it was Pride and Prejudice. What is happening to me now might be because of my reading. It’s not that now I don’t—I do, I still believe in the body, but where I used to think, Americo, find yourself someone from the neighborhood, something like you know, now it’s Americo, you’ve got to find something different for yourself, someone like you don’t even know you don’t know. Of course, not all of my ideas come from books. Just like before, when the folks left, I could have gone with them, but I figured, me, Americo, I was born here, I’ll stay. And that I’d find something to do, even for a little while, and buy myself some kind of car. That was an idea all my own. I still get them. Now, if it was cold today, I would just sit in the car in the sun somewhere and read, but when it’s warm enough like this, I drive up to go read in the park. And best is that it’s not a factory town, not our city. Every minute somebody’s got a different reason for moving a car, I don’t worry about parking. So as close to Seventy-second Street as possible, to walk in on the path to the right of the road there. Up past the Bandshell, then down the steps and over to where the grass slopes off to the Lake, that’s before you get to the Boathouse. You see those people out there in the rental boats? As some philosopher said, they think they’re having fun and they are. You like my island, all of two feet from shore? It’s the only rock here that’s big enough to sit on while keeping your feet dry. Today’s book is Mansfield Park. You’ve got to be careful where you read a book. This rock’s a good place—it’s outdoors, but with the trees leaning in like they are, it’s enclosed, almost like indoors. I could never read up at the Great Lawn between the Eighty-fifth and Seventy-ninth Street transverses. All that sky. Last time I walked through there I caught myself mumbling. “Life could be beautiful.” Because of the way that the space is so open there. For reading, it would be worse—you’d close the book thinking, wasn’t it great, that the whale didn’t get Ishmael. It was only a plan, you can’t always get too far with a plan. At least you shouldn’t start believing too much in the picture of it, the one you put in your head as you ask your question. Because a question can get answered with questions: “Fun?” “How is it fun?” And maybe you will or won’t try to say why it’s fun to take some coffee and go downtown to the West Side by the Hudson and spend the afternoon sanding and painting the fender. That it’s fun like an outdoor shower is fun unless you can’t see that it is. So you ask your question and the answer you get gets rid of your question, gets rid of your plan, but still you can’t get rid of the picture. I was opening a bank account for my T-shirt business, and I don’t know how the form put it, but what the man asked was, “Parents?” So I said, “They’re in Puerto Rico.” Then he said, OK, but what he meant was living or dead. And I thought, yeah, Puerto Rico, if I stay here and they stay there, it’ll always be like a third thing for me. It did, but now it doesn’t surprise me how many people don’t see the bat. They see the yellow, which looks like an upside-down crocus with its leaves reaching up to it. Some people get pretty angry: “Bat?” “How is it a bat?” And what should I say? Maybe, “Mister, to you, it’s the Sign of the Crocus!” Or, “Lady, you must know Crocusman!” What should I say? And will it matter, whatever I say? Like right now, it’s not just that your eyes do or don’t see the bat on my T-shirt—it’s your mind that’s seeing just one thing at a time, bat or crocus or bat. And, on the weekends, that’s seeing my stand full of T-shirts and not seeing me, Americo, seeing you seeing or not seeing the bat. But some days what even I see is the crocus and then I have to turn my own mind around to start seeing the bat. Me, Americo. And those are my T-shirts! I always worked weekends. It was interesting, growing up around the store, people coming and going. And it was a real grocery store, not a bodega, bigger, but not a supermarket either. Smaller, a grocery store. It’s still there, and run by a family. Sometimes when I walk by it, especially at night, what I see is a play in which just the faces are new. I could go in, they don’t know who I am, or even if they did, I could, but why? Now if I need something, I go to a bodega, or a supermarket. When the twins worked the two side-by-side cash registers for Pa-pi after school while they were finishing junior high, they still looked alike to me. When one of them started to paint her fingernails red I thought they still looked alike, except for that. Even the way they pressed their fingers against the buttons on the registers, even that looked alike. Isabel, Sucia, Ola—it’s no excuse, but when you’re growing up and have three big sisters, you don’t always get to be much of a brother. And the twins had each other. So when I went into the back room at the store that day and saw the twin who wasn’t painting her fingernails sitting there on the floor, sideways to the wall, knees gathered up and face into them, crying, I didn’t know what to say. I looked above her, at the shelves where the twins when they were younger used to crawl up into the empty spaces and take naps there together. They were small, the twins. Even if she didn’t say any more to me then, or really much to anyone after that before leaving for Puerto Rico, I was up all the way to one minute in my life when I had someone to talk to, and now I’m always thinking that the next minute could come any minute. She’s the only one with the folks now since the other twin met some guy and moved to Florida. If I call Puerto Rico and the twin at home answers, she says, “How are you, Americo,” and gives the phone to Pa-pi, who says to come visit, that the coconuts fall and you drink the milk from a straw, and that at night the guys play drums around fires on the beach. Then Ma-mi takes the phone and says that because the ocean there is the same temperature as the air, you can’t tell without looking which part of your body is in or out of the water, and that the flowers she grew on our bathroom windowsill in New York grow wild everywhere on the island. The twin never takes back the phone. If I call and the twin answers and she’s the only one there, she says, “How are you, Americo,” that Ma-mi and Pa-pi aren’t there, to call back when they’re there. “Miracles me no miracles.” I don’t know how John Bartlett missed it. I spotted it right away, it was fresh in my mind because B comes before C.
After all, Bartlett had other things from Don Quixote. There was: “He had a face like a benediction.” “Every one is the son of his own works.” And something about sleep covering you like a cloak, that it was “heat for the cold and cold for the hot.” I remember that. He even had stuff from another book by Cervantes, La Gitanilla, “The Little Gypsy,” which I get to read soon. I know—in Spanish, Milagros is also a girl’s given name. I don’t know anyone by that name, but I can miss things I can’t even remember and people I don’t even know I don’t know. Anyway, you can’t go by names, you get surprised. Just like the three little words that you hear might not be the ones you’re expecting, the ones you could want for the long run. Rick Rofihe is the author of FATHER MUST, published by Farrar, Straus & Giroux (Editor: Jonathan Galassi; Agent: Gail Hochman). For a free download of his book of nine New Yorker stories, BOYS who DO the BOP, go here. 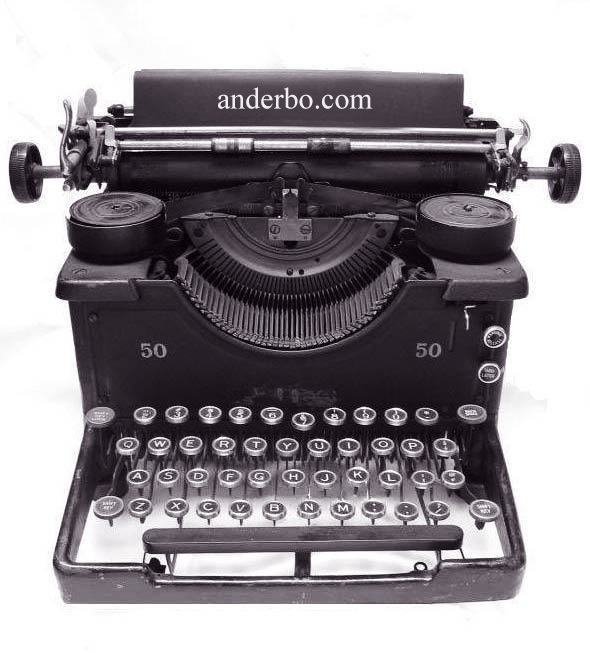 Rick is the judge for the annual Open City Magazine short story contest at Anderbo, the RRofihe Trophy. Rick is the Publisher & Editor-in-Chief of Anderbo.com.